I’ve been swarmed with codes lately, I think that’s how life’s gonna be when you belong to the middle bracket of society, you work harder than you ever could. But even with these life’s craziness, I just can’t live a day without reading few pages before going to bed. It’s a habit I’ve nurtured since forever. 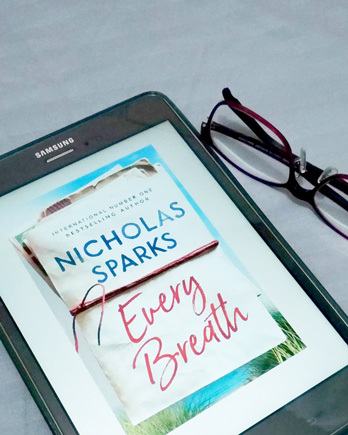 I’ve scored Nicholas Sparks’ lastest book, Every Breath on my Kindle app, I’ve done reading it and just thought would want to share with you what I think about it. Every Breath is a story of timeless love, romance, and how fate can be so forbidding sometimes. Hope Anderson, the heroine in this book, fall in love with Tru, a safari guide from Zimbabwe while visiting her vacation haven in North Carolina. Hope chose to be with Josh, her boyfriend of six years in the hope of fulfilling her lifelong dream to be a mother. After reading this book I realized that more than anything, our decisions in life can really make or break our destiny. And there are elements we should battle that weigh more than our yearnings for someone else. The Kindred Spirit mail plays a focal point in connecting and reconnecting the characters in the story. The mail box was owned by no one but by everyone. The story sums up few words for me - if you’re meant to be together, no matter how crazy our life’s detour be, fate will always find a way. Nicholas Sparks always weave magic as he tells his story. Every Breath is one book you should read, especially those who are finding love in second chances.